Baby Cry Sound Signaler BC400 - Weitbrecht Communications, Inc. 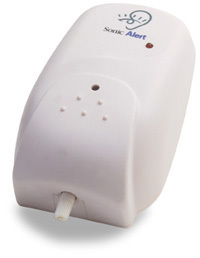 The Sonic Sitter, model BC 400 is a small, attractive unit that immediately alerts you when your baby starts crying. The BC 400 has an adjustable sensitivity control, and can be set to alert you to sounds as soft as a baby’s whisper. The BC 400 simply plugs into any outlet in the baby’s room. So your baby is not disturbed, no lamp flashes in the baby’s room. When your baby cries, the BC 400 sends a signal over your home’s electrical system to remote receivers, so it is completely wireless! You can rest assured that you will always know when your baby is crying and needs you. The Sonic Sitter also has a built-in indicator light to show you it’s working. Please remember you need to use at least one remote receiver with the Sonic Sitter. Please Note: In order for signalers/receivers to communicate with one another, each device needs to be plugged into electrical outlets on the same electrical circuit. If you have any questions, please don’t hesitate to contact us via Live Help or by telephone at 800-233-9130 (V/TTY).